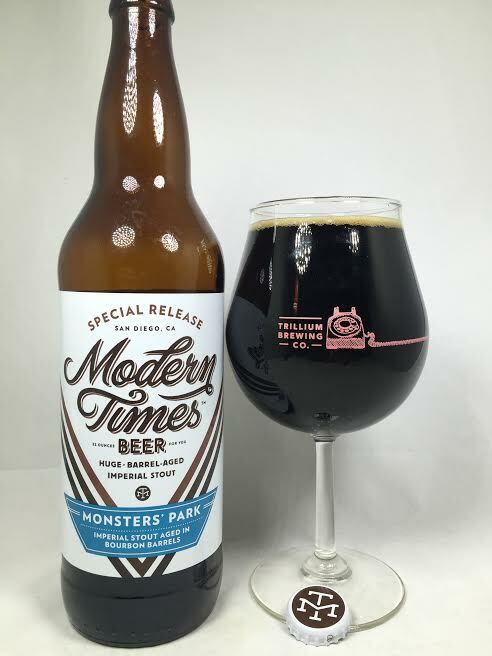 "Monsters’ Park is a hulking, cantankerous imperial stout sporting a brawny malt bill and a dry, lingering finish. Its massive roast profile blends with an eye-popping coffee, chocolate, and toast character, which combine to provide a monumentally robust & aggressive experience. Monsters’ Park has an incredible chocolate and roast nose that is surprisingly balanced for the higher alcohol content. The flavor is complex, with chocolate, roast, dark fruit, coffee, and more that linger as you sip." Pours to an inky black body with a finger of light brown head. When I tilt the glass and hold it at the right angle, I do get some ruby red on the edges, but other than that this is a black hole in appearance. All of the usual suspects are here on the aroma, but they really do pop. Sweet bourbon, oak, coffee, and even touches of black licorice or anise. I'm also getting raisins, cherries, and a really cool leathery smell. The first thing I taste is (obviously) the bourbon, but it is immediately kicked to the curb by this dessert-like, chocolate-covered cherry cordial flavor. As it warms, bitter dark coffee becomes a pretty big contributor along with a lot of wood from the barrel. So much wood in fact that you could probably build settlements in Catan (Anyone? No? Ah, go f**k yaself). After the wood (giggity), fluffy milk chocolate and just a tiny bit of the dark fruits of the aroma come back, but the latter had a bigger impact on the nose than the palate. The finish has residual bourbon stickiness and coffee grounds. Mouthfeel, while full, isn't as thick as I'd like to be for a BA Imperial Stout. I will say that the 13.7% is nowhere to be found. In these cold winter months, this is a pleasant sipper. Monsters' Park definitely had every aspect you want from a Bourbon Barrel Aged Imperial Stout. Not everything from the nose showed up in full force on the taste, but my taste buds did catch a majority of the action. I think the lack of a thicker body (you know, more like mine) and a bigger pop of flavors from the base stout, hold it back from being elite, but this is still a very good BA stout that you should grab off the shelf. The wife and I debated heavily on this but were eventually dissuaded by the price because we couldn't find a review that adequately informed the reader of the experience. You sir, have done just that. Also, we are a Catan household, so bravo. Yeah, price of admission was a bit much. As soon as I find a beer that allows me to make a Risk 2210 A.D. reference, then I'll be in business.